Sachin Tendulkar has described being voted into ESPNcricinfo's all-time World XI as "unreal", and the team as "extraordinary company to be in". Tendulkar is the only current player in the XI, the rest of whom are four Australians, three West Indians, two Englishmen and one Pakistani. Tendulkar said he would have loved to play, talk about the game, and pick the brains of his batting partners in the XI - especially Don Bradman, who once said Tendulkar reminded him of himself. 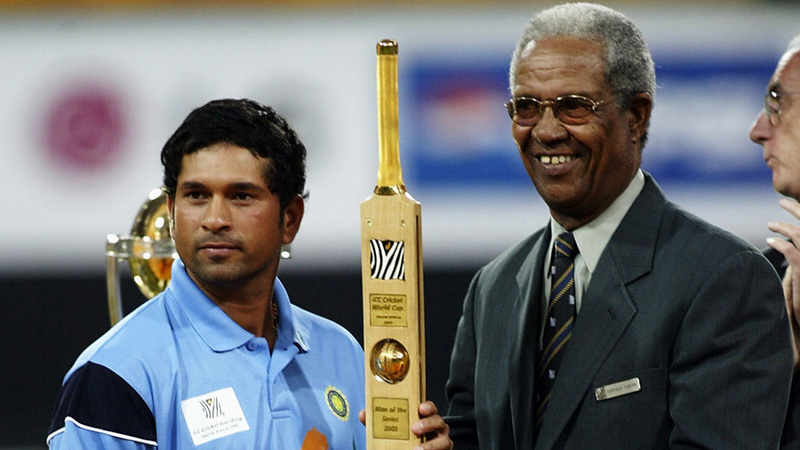 "It would have been great to play in this dream team, to walk out with Bradman after lunch, or build a partnership with Viv Richards, and talk to Sobers about cricket," Tendulkar told ESPNcricinfo. "Just playing and having a conversation with them about cricket. I would liked to have asked Hobbs and Hutton what it was like to play on uncovered wickets, who were the best bowlers they had faced, and of course, the mental aspect of the game." Tendulkar, whose international career is now in its 21st year, was particularly pleased with the fact that he had played with or watched live nearly 60% of the side. "I played with Malcolm Marshall in county cricket, I played against Viv Richards in an exhibition game, and Lillee bowled to me at the nets at the MRF Pace Academy, when I was 15," he said. "It was such a thrill. I remember I called my brother and said to him that Dennis Lillee had bowled to me. So to now find myself in this company is unreal. I first met him when I was 12. Wasim Akram, one of three fast bowlers in the XI, described being picked in the team as one of his biggest achievements. "I never thought I would play for Pakistan, let alone be picked for an all-time World XI like this. It is a very special thing, to be picked by these judges and even more of an honour to be in the same team as guys like Sir Don Bradman, Sir Viv Richards, Sir Garry Sobers, Sachin and the others." Akram said he was happy to be named alongside his bowling hero, Malcolm Marshall. "A lot of people ask me who was the best bowler I ever saw. Imran was great, no doubt, very hardworking and shrewd. Dennis Lillee I never really saw, but people tell you obviously about how good he was. But when I rate a bowler, I look at how he did around the world, on different pitches in England, the subcontinent and Australia, and Malcolm Marshall, I feel, was the best of the lot. Adam Gilchrist, who is one of three players to make the XI who retired in the last decade (the others were Shane Warne and Akram) said many other wicketkeepers could have been picked instead of him. "To be one of only four Australian players to be chosen is an absolute honour, although I do think there were several other wicketkeepers, like Rod Marsh, Ian Healy, Mark Boucher or Alan Knott, who could have easily been picked ahead of me in this team," Gilchrist said. Knott came close to being picked: only eight points separated him and Gilchrist in the final reckoning. Lillee, who led the fast-bowling list in the votes, said it was an honour to be picked by a jury that was made up of eight Test captains as well as respected historians and writers. "Looking at the composition of the team, it's hard to question any of those selected. Though some great players have missed out, it would be interesting to pick another world team from those remaining, and I'm sure even that team would push the one that's been selected to the limit," he said. All-time XI: World Who after Bradman and Sobers?